While he was Editor-in-Chief at the Escapist, an article written by "The Escapist Staff" gave positive press to board game Adventurer Conqueror King System, originally without disclosing that the game's publisher Autarch was co-founded and managed by the Escapist's publisher Alexander Macris, and that it was authored by Macris himself and by then-employee and future the Escapist Editor-in-Chief Greg Tito. Current version of the article properly discloses. Previewed a game by Harmonix without disclosing that she was romantically involved at the time with a Harmonix press representative. The Escapist promptly added a disclosure to the article when they were informed of the issue. 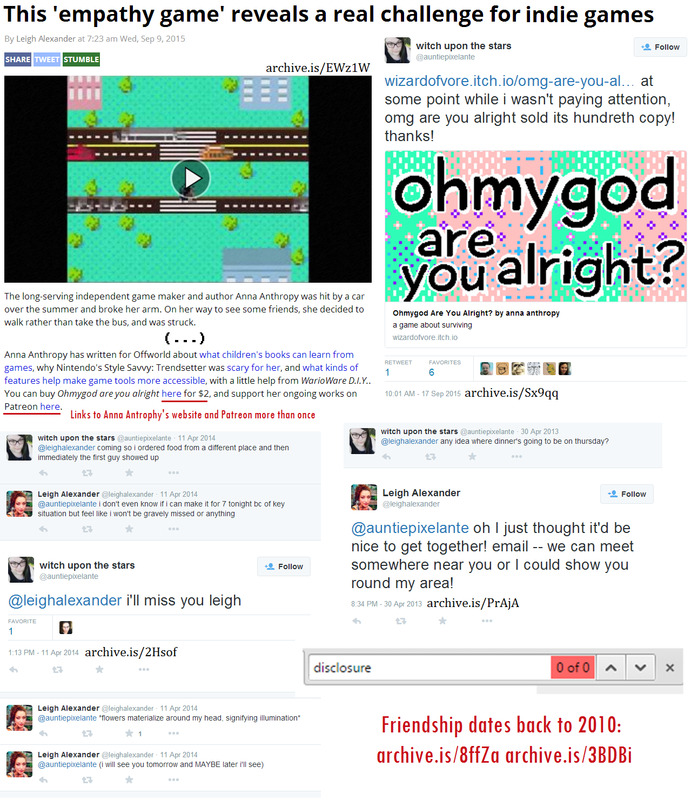 Disclosure was added between 02.23.2016 and 03.24.2016, after Rene had left The Escapist. Originally a Themis media propriety, was purchased by Defy Media in 2012. Dropped its PDF edition and weekly format in 2007, along with a site redesign. Has historically featured a large amount of video content — introducing Extra Credits and The Jimquisition, and still featuring Zero Punctuation. Originally on GamerGates boycott lists, it kept a neutral stance through the consumer revolt, publishing opinions on both sides, and allowing discussion of it in its forums. It was placed on GamerGates support lists when it was the first large website to employ significant changes in its ethics policy, which involved all of Defy Media.